As you guys know, I am an avid, head over heels gardener. I love my garden, and although I use chemical fertilizer at present, (MiricleGro) I love learning about all the natural, self-sustaining methods that I can implement without extra cost. A friend of mine shared this video with me made by Paul Gautschi, and it just blew my mind—a totally green, and cost-efficient way to have a bounteous garden! It saves all round—water, soil, natural nutrients—it's all a circle of absorbing and returning. Now I'm really eager to be able to have my own yard—I want a gigantic garden run completely the natural way, as Paul Gautschi has so kindly laid out for us! And it is SO SIMPLE. What an incredible blessing! And could you imagine having your own fruit trees, berries, flowers bursting all over the place, and tomatoes so plenteous you have to give to your neighbors? (By the way, homegrown tomatoes are to DIE for--pick and cut, sprinkle with salt--pure divinity). Here is the link everyone—I greatly suggest you take a look if you want as bounteous, self-sustaining garden! 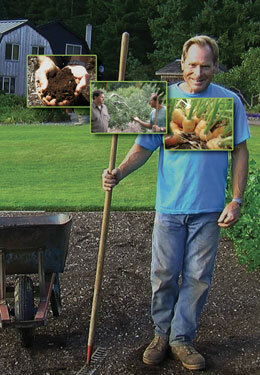 If you guys implement this way of gardening, please share with me how it's working for you! I'd love to post your pictures, your progress, your overall story. Doing things as green as possible is really important to me, and I love to share!